Cannes, May 29 — The Horyou Foundation hosted its first Gala Dinner at the Villa Saint Georges on May 20 amid the 2015 Cannes Film Festival. The Gala, dedicated to supporting a wide range of endeavors for social good, brought together an important group of esteemed guests of honor and featured live performances. At the cocktail hour, Horyou CEO Yonathan Parienti welcomed the attendees and special guests while artists Lassad Metaoui and Rémi Bertoche conducted live painting in the villa’s gardens. Yonathan returned to address the guests, outlining the Horyou Foundation’s support of the 700 organizations present on the online platform of Horyou, the Social Network for Social Good. Many other proponents of positive action attended this exciting event. Guests of honor UNESCO Goodwill Ambassador Marisa Berenson and Dr. Georges Bwelle, an altruist and CNN Hero, shared their experiences with the captive audience. Other special attendees included humanitarians Lamia Khashoggi and Debra Mace from Children for Peace, Claudine Fischer of L'association Pont Universel, producer Lawrence Bender, flutist Wang Wei, artist Ma Tse Lin, General Marc Alban, actress and producer Carla Ortiz, calligraphist Lassad Metaoui, “man of cinema” Pierre Rissient, auctioneer Pierre Cornette de Saint Cyr, painter Ghass, singer Mike Massy, humanitarian Michel Baumann from The Meal, Phoenix TV anchor Lucie Liu, singer Carmen Maria Vega and Zakary Chanou, CEO of hospitality concierge UUU. A sumptuous dinner was presented by renowned three-star Michelin chef Marc Veyrat. Showcasing Veyrat's specialty of molecular gastronomy and use of organic mountain herbs, the dinner was the centerpiece of the Gala. Kambiz and Nilou Safinya from Sonatina Vineyard were also special guests, presenting from Lake County in Northern California their exquisite Xurus Cabernet Sauvignon and Sauvignon Blanc, which perfectly accompanied the creatively designed dinner. Uber, La Mamounia hotel in Marrakech, UUU, L'Art de Marcillac, Hôtel Le Crystal Cannes, creative content company Splendens Factory and Champagne Jacquart were also part of the notable group of partners. Live entertainment included famous pianist Chow Ching Ling – a guest of honor – and flutist Wang Wei. A special thank you also goes out to the prolific and vibrant singer Licia Chery. After the Gala, a private party was electrified by the band Jeffrey & the Crazy Diamonds. Founded in Geneva in January 2014, the Horyou Foundation promotes and advances causes for positive action. It plans to fund hundreds of international organizations on the Horyou platform. It provides support ​​primarily to groups involved in humanitarian efforts, aid to science, protection of the environment, promotion of education and support of the arts. The Foundation’s goal is to embrace concrete actions and causes in harmony with the fields listed above anywhere in the world. Its collected funds are redistributed directly or indirectly in the form of participation in, or contribution to, individual and group projects. Additionally, it is planning scholarships and funding to scientists and inventors, as well as any endeavor dedicated to improving lives and living conditions. The Horyou Foundation relies on the generosity of organizations and individuals to fund projects and offer direct support to the non-profits and associations that are lacking funds to continue their work for positive change worldwide. 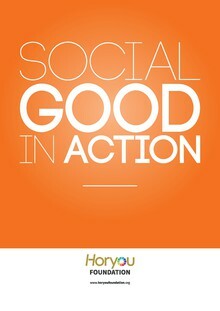 Horyou’s Members, Organizations and Personalities promote a humanistic approach to technology to encourage social good, provide quality content and prompt meaningful interaction. At Horyou, social networking facilitates the process of transforming ideas into concrete actions, while contributing to the building of constructive relationships between the online and offline worlds. Let’s Dream, Inspire and Act. Register now to receive free email alerts of press releases or login to manage your preferences. You can also subscribe to RSS feeds of press releases by category or keyword here.